Everyone knows that flossing is needed. If you visit a dentist regularly, he will ask you if you use floss to clean between teeth. Usually, people use string floss because it is cheaper than water flossing device, but water flossing has its own benefits and advantages compared to string floss. Water flossing is a natural way of cleaning between teeth by applying water under pressure. Even dentist use water flosser when they check your teeth. Water flossers can remove plaque, gingivitis and overall improve gum health by applying a water massage. People who have orthodontics like braces, bridges or crowns can see enormous benefits of using water flosser because water flosser will remove all the debris stuck in orthodontics. This cleaning will give you much fresher breath and healthy teeth. Water flossing is a great way to keep your teeth clean, but it is not a replacement for toothbrushing. You should still brush your teeth two times per day, ideally early in the morning and before the bed. Toothpaste has its own benefits, like fighting the harmful bacteria which can grow in your mouth if it is not treated with proper toothpaste. Water flossing only cleans debris with water, it can not kill bacteria. It is highly recommended that you use water flosser once per day for best results. Pechan is first on the list because they made extremely affordable dental flosser which you can use at home, but also without a problem take it with you on travel. The size of the dental flosser is small, and I Am sure it will fit in your bag. 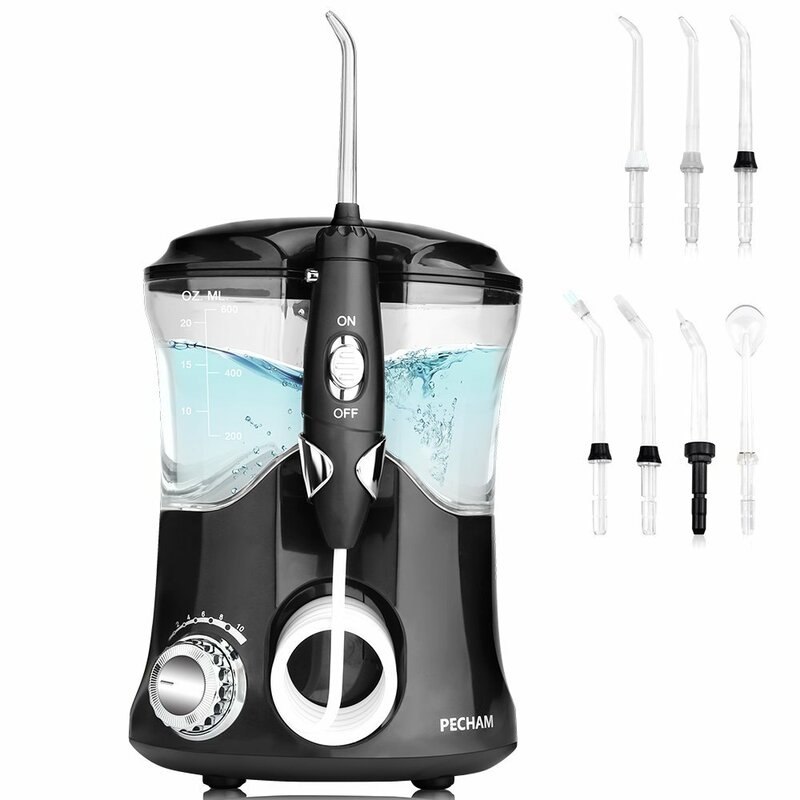 Pecham water flosser consists of a 600ml tank which is removable, the engine that push the water under a pressure and jet tips. In the package, you will get 7 tips. Three jet tips are included, and they are used for removing debris between teeth. Also, dental plaque tip, orthodontic tip, tongue cleaner and orthodontic tip are included. Tongue tip is ideal for cleaning the bacteria on your tongue and in that way preventing a lousy breath and spreading of the nasty bacteria. The pulse on the Pechan dental flosser is strong and is good enough to clean all debris after a meal. Clinically proven to be better than the string flosser and it can remove 99.9% of plaque. One water flosser can be used by a whole family because it includes three colorful jet tips. The water pressure can be adjusted, and you can use the power from 1 to 10. One is usually used by kids, and 10 is for maximum pressure and is mostly used by experienced flossers. Ellesye dental flosser is almost same as the Pecham. It works on the same principle, and it also has a 600ml tank. The only difference is price and packaging. Ellesye is more expensive than Pechan water flosser, but you will receive 4 jet tips and 2 tongue cleaners for that price. That is more than Pecham offers, so in case you have a larger family then Ellesye is a better choice for you. Power and effectiveness are the same because both products are identical. Zerhunt brings us a much different water flosser than the two previously mentioned. This water flosser is ideal for travel. It is small and works on battery. It has 1400mAh battery that is more than enough to provide a steady pulse and pressure. The battery needs 4 hours, but when recharged it will last for up to 20 days. The whole water flosser can fit in one hand, which is ideal for traveling, but because of that the water tank is small, and you will probably need to fill it more often than on large tanks water flossers. 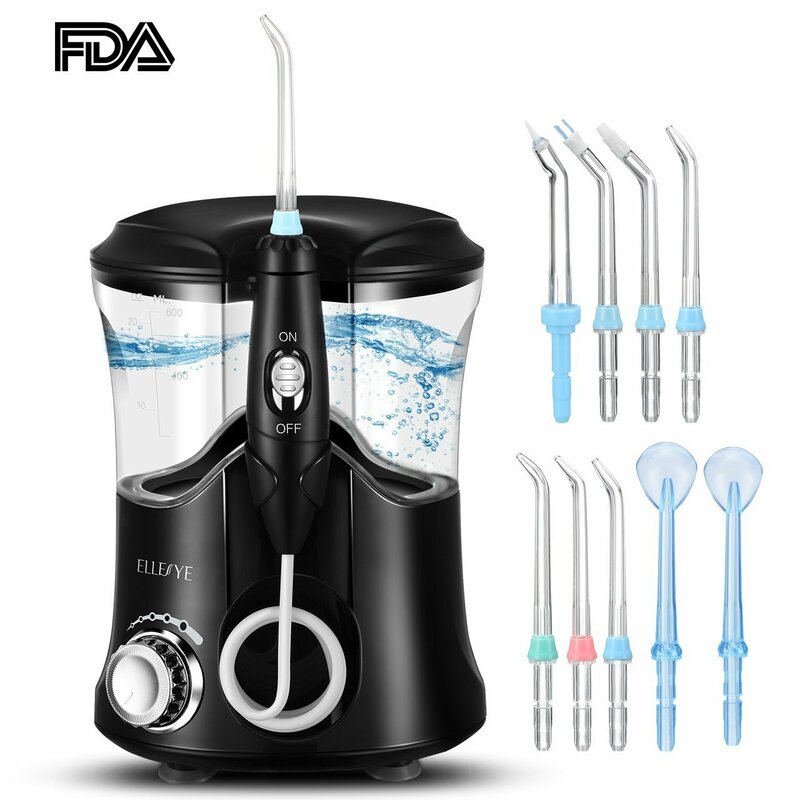 This mobile water flosser only has 3 nozzles, but they work perfectly and can be used for debris cleaning, orthodontic cleaning, and gum massage. 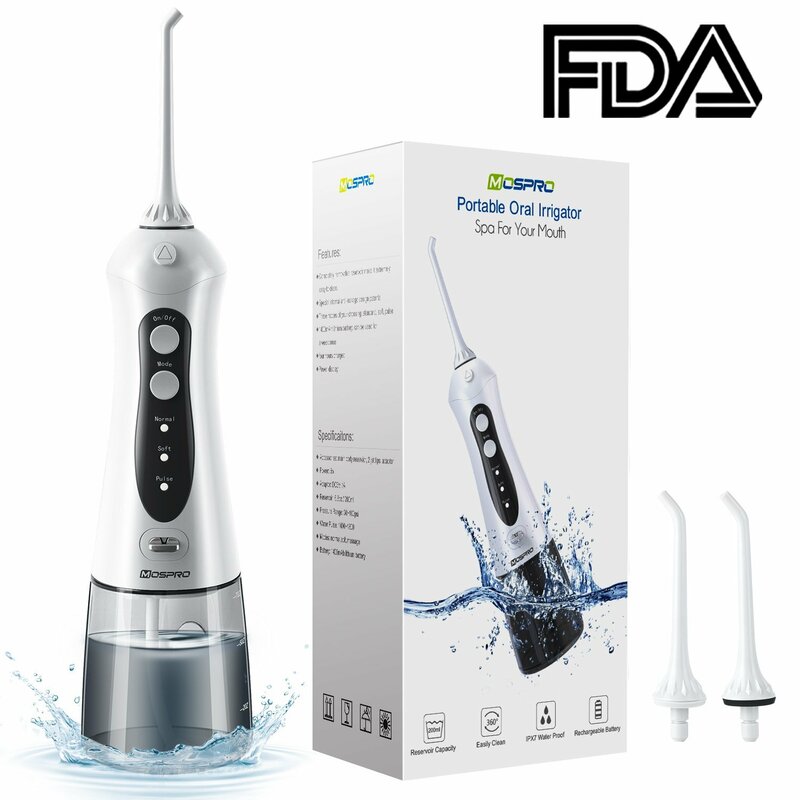 Zerhunt Cordless Water Flosser has FDA, FCC and ETL certificate and is perfectly safe to be used. This certificates also guarantee quality. Zerohunt also provides guarantee and money back. You will get 90 days money back and 12 months guarantee on this product. Greenvida made the same water flossing model like Zerohunt. The water flosser is small and light to be carried everywhere you go. It is very beneficial to have this little device in your bag or pocket and water floss every time there is a requirement. Many times you will find your self in a situation that some debris just get stuck between teeth. With water flosser, you can remove that debris in no time. Greenvida has the strong battery of 1500mAh which can be recharged by USB cable. Thanks to the powerful battery once fully charged you are free to use water flosser for a whole month. In the package, you will receive 4 jet tips. Each of these small traveling water flossers has three modes of operation. Standard mode for normal debris cleaning. Gentle when you have sensitive gums or tooth, and you just need to be careful not to irritate the sensitivity area. And pulse mode which is more than useful. Pulse mode will provide a gentle massage to your gums and teeth. With this water flosser, you can quickly remove debris, bacteria, and plaque between teeth. 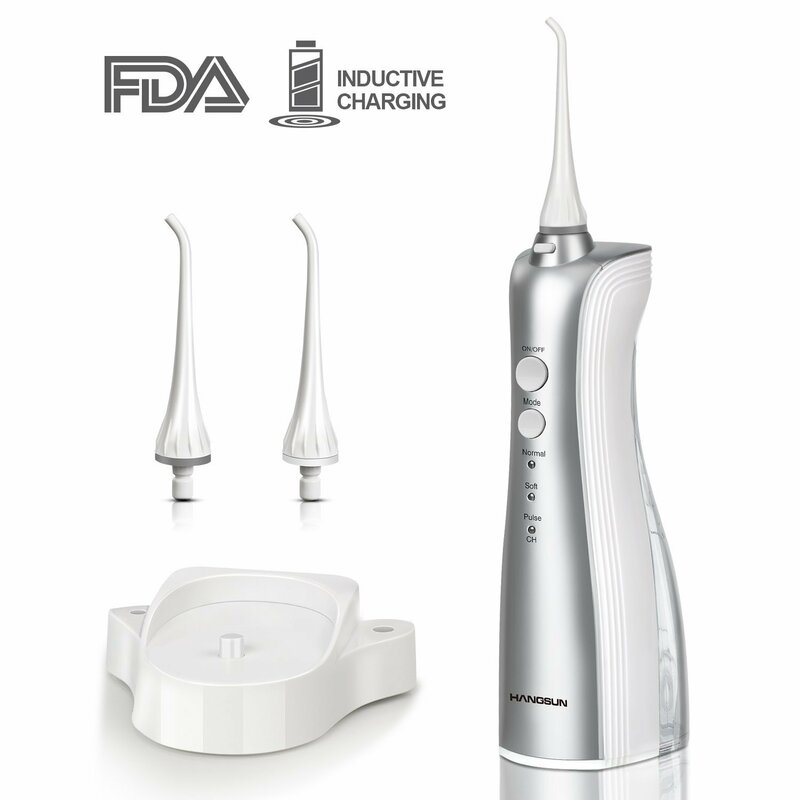 Mospro mobile dental flosser has 1400mAh battery which needs 4 hours of charging and lasts around 10 days. In the package, you will get 2 nozzles, and maybe that is the reason not to pick this model over others. Other models give three nozzles, but if you trust and like Mospro, then I don’t see why you should not buy this product. Hangsun made a step up and created a low noise dental flosser. With this dental flosser, you can floss even when working. The tank is maybe not the largest, but it is good enough to clean all your teeth. 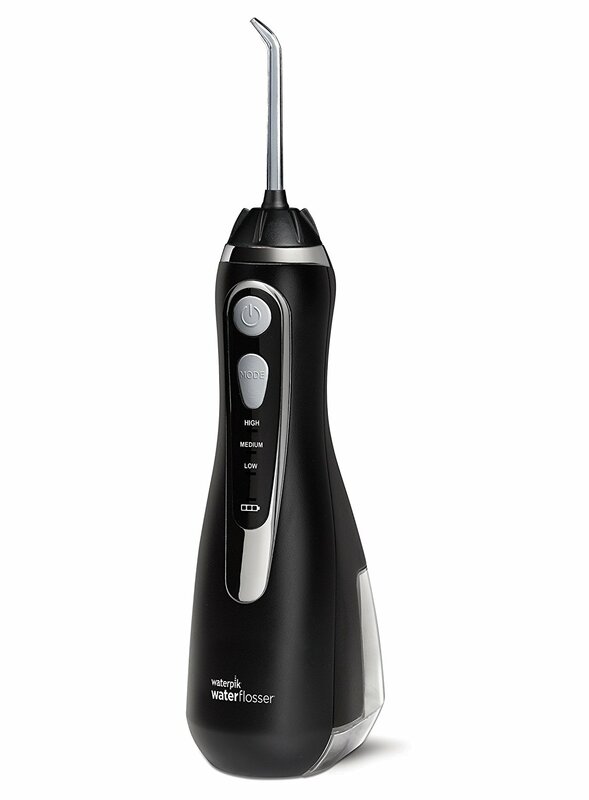 This water flosser also has three modes, and it works just like other mobile water flossers. But the most significant advantage of this water flosser is an ability to be washed. You can drop it in, and there will be no malfunction, it is 100% waterproof. Another nice feature is a stand with two jet tips and charger. You can place the stand in the bathroom and put the water flosser for charging, this way you will always have fully loaded water flosser. Every day at visiting the bathroom you will see the flosser and bring it with you on the work. H2ofloss made a device that can clean all breathing holes. The standard tips can be used to clean debris from teeth, but this device also has two nasal tips which can clean nose. With this water flosser, your daily hygiene will be done in short time. The device has tips storage, 800ml water storage, on and off switch as well as power adjustment right on the handle. This is very useful if you want to operate with one hand. In the package, you will get 12 tips for various uses including two already mentioned nasal tips. The tips can all fit in the tips storage container. Waterpik is one of the leaders at providing the best water flossers on the market. 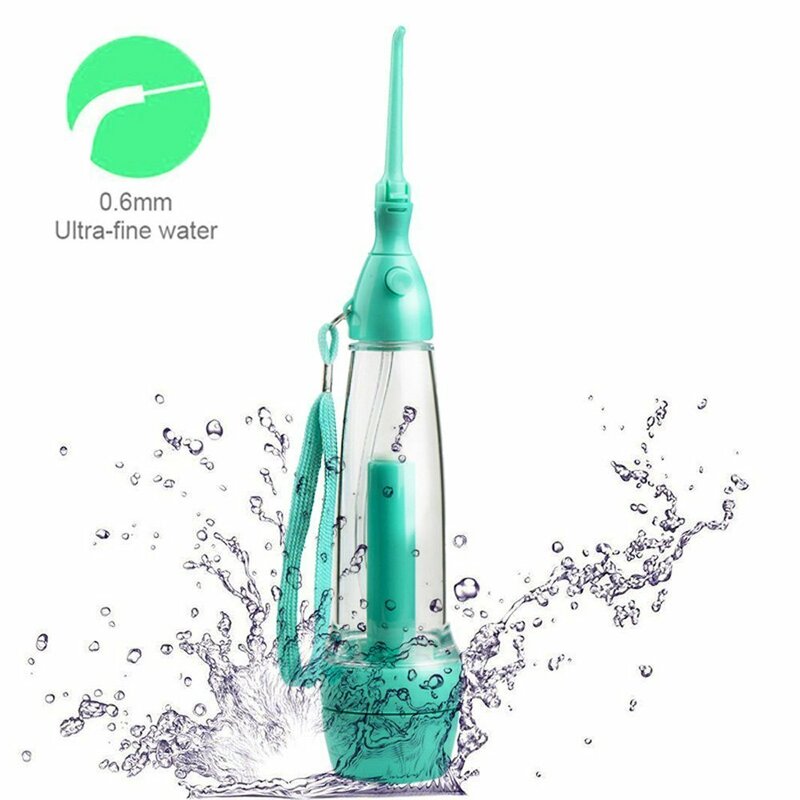 Just by looking at the design and quality of which is this water flosser made you understand that this device works flawlessly. With a Waterpik water flosser, you will get 7 tips. Standard 3 jet tips but as well as 4 specific tips. One of the most interesting tips is a toothbrush tip which can be useful in case you decide to apply toothpaste. Plaque Seeker tip is also unique tip which is best used to remove plaque. 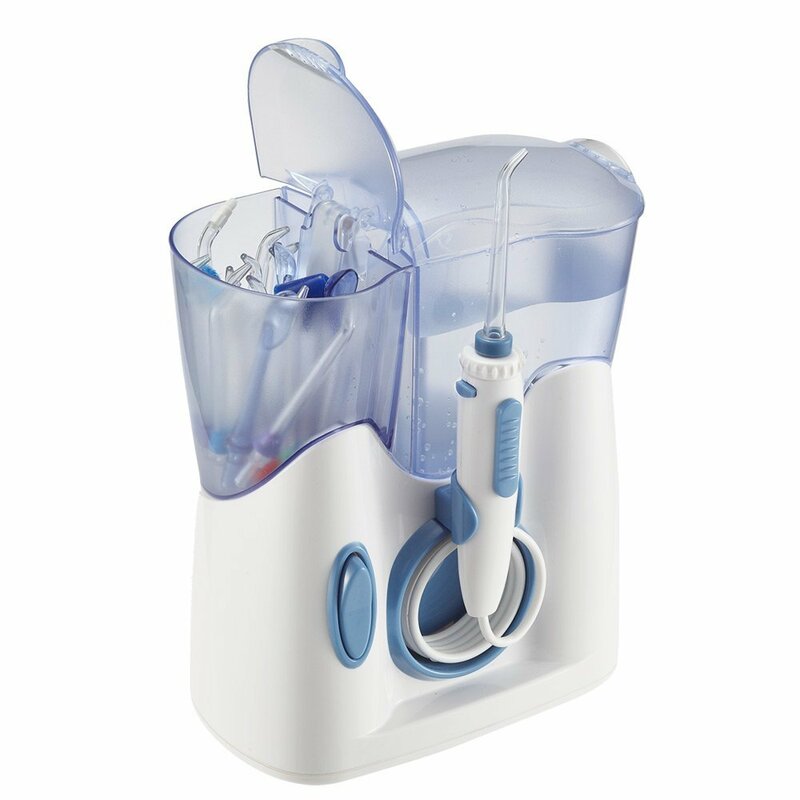 With Waterpik, you will easily floss every day without pain. You will no longer look at string floss and all the accidents that may happen to the gums by cutting with a string. With water flossing you are safe, and if you want lower pressure, you can adjust from 1 to 10 modes. 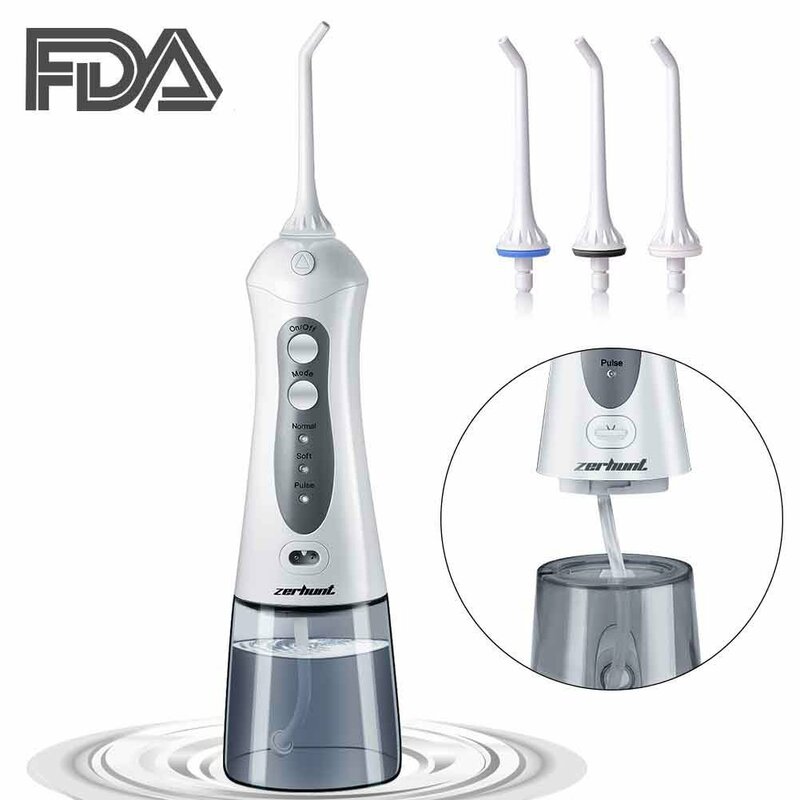 Waterpik gives a full 3-year warranty, so you are perfectly safe when you buy this product, it will serve you right for at least three years, but I Am sure this fantastic water flosser will serve you longer than that. Carejoy made a fantastic water flosser that runs without electricity. The power of the pressure is applied by pumping the pump at the bottom of the device. Not using batteries allows this product to have a larger water tank and at the same time stay light and small. The whole device is waterproof, and that means you can without a worry carry it in a bag entirely filled with water. This water flosser is for personal use because the jet tip is not removable. That is also a disadvantage because you can not select different tips for different purposes. But overall this product is extremely affordable, and I Am sure it will make your teeth healthy and clean. One of the best mobile water flossers on the market is made by Waterpik. This amazingly good looking device is all you need on a travel to keep your teeth clean and free from bacteria and debris. With this device, you get 4 different tips which you can quickly replace. The water tank is not large, but it can be filled fast and without any trouble. 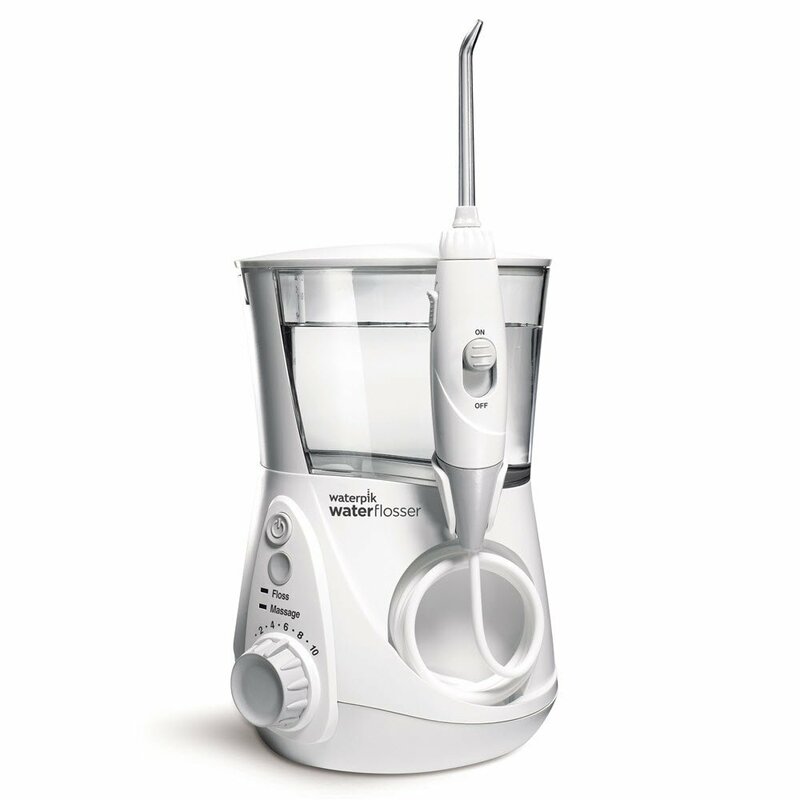 Like all Waterpik products, this one is also awarded by American Dental Association. 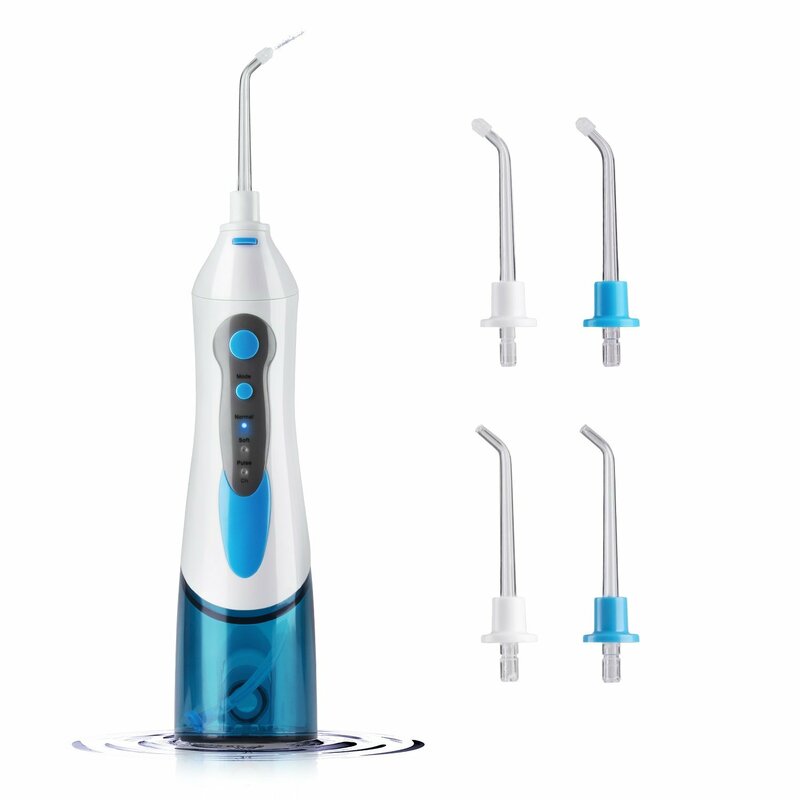 With this product, Waterpik guarantees healthier teeth in just 14 days. If you are not happy with the results in 14 days, you will be refunded. This offer is amazing, and if you are looking for your first water flosser, then this is a good deal. You can spend money on some second hand lousy made water flossers that will not work and just give up on water flossing. This can be a huge mistake because water flossing is proven to help with teeth hygiene and overall mouth health. With an excellent natural toothpaste which can kill bacteria and a decent water flosser, you will never again need to hear a dental drill. Your teeth, gums, and breath will be in harmony with nature. What’s better than cleaning your teeth with just water? I can assure you that the above-mentioned water flossers will help you keep your teeth away from offensive dental operations. When you are visiting a dentist for a teeth checkup, you will be safe that no teeth disease will be found. After some time you will love your dentist and no longer be afraid of him and his apparatus.